Michelin-worthy Italian food… in an extravagant and ancient riad? Fusion dishes sampled under the watchful eye of a Pop art painting of Albert Einstein? A juicy burger consumed in a minimalist, Scandinavian-inspired space decked with modern art? 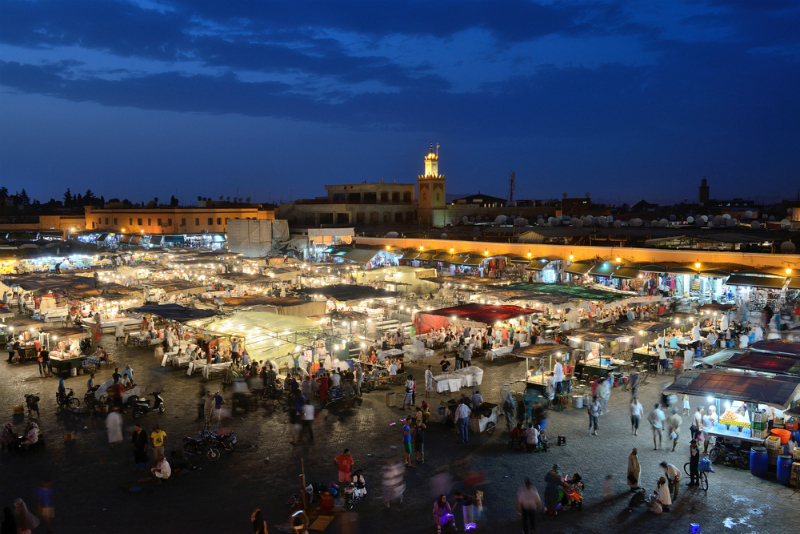 Marrakech is a playground for the global jet-set, a discerning crowd known for their love of good food, and the dining options don’t disappoint. Morocco has a strong culinary tradition, and most locals prefer to eat at home — but for travelers, there’s no shortage of world-class eateries to choose from. Unlike in many parts of the globe, however, the settings you’ll find yourself feasting in are often hundreds of years old, and lavishly appointed to boot. From the intimate riad restaurants of the medina to the ultra-chic cafés of the Ville Nouvelle, there are myriad options for where to eat and drink in Marrakech. Still parched post-dinner? Revelers can pick from a mix of fashionable after-hours boîtes to slake their thirst with a cocktail or two — and some great music, courtesy top-notch DJs that roam the mega-clubs of the world. 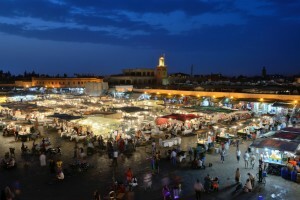 Your first night in Marrakech should be spent in the famed Djemaa el Fna square, where mobile food vendors jostle for space with countless belly dancers and snake charmers. Settle down at a stall and order some kebabs and freshly squeezed orange juice, then take in the live show unfolding around you for free. If you’re not ready to test your GI system on street food (though trust us, these kitchens with piping hot dishes being doled out by the minute are safer and cleaner than many you’ll find back home), you’ll get a great seat for the spectacle at one of the terrace restaurants bordering the square, Marrakshi being one of the best. 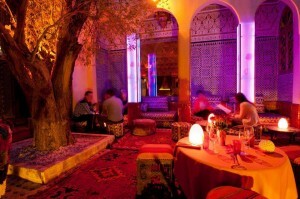 The sultry belly dancers inside the eatery compete for your attention with the jovial street-fair atmosphere outside. For a place that could very easily become a tourist trap, the authentic Moroccan fare is actually quite impressive — the harissa soup in particular deserves a mention. 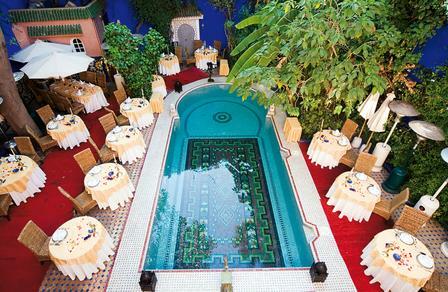 For a truly lavish Moroccan meal, book a table at celebrity chef Moha Fedal’s Dar Moha, a fine-dining experience favored by discerning palates like Oprah Winfrey and Will Smith. The restaurant is a posh manse once home to the designer Balmain, a soothing and tranquil escape from the medina mayhem. He elevates traditional Moroccan flavors by introducing unexpected ingredients and methods: think seafood pastillas or couscous with foie gras. For something that doesn’t stray too far from the traditional, consider booking a table at Al Fassia, in the Ville Nouvelle. This elegant female-run restaurant serves an endless array of traditional hot and cold mezze, and a wide variety of tagines. Tagines are also aplenty at the quirky Djellabar, another Ville Nouvelle standout — but here they sit side-by-side on the menu alongside fusion dishes like pasta with spicy merguez sausage. The unusual space — an über-ornate former wedding hall turned into a kitschy pop-art lounge, complete with paintings of icons like Gandhi and Elvis donning fez hats — has a fabulous cocktail list, and is a bumping nightspot as well. Did you expect anything less from a Moroccan offering from the founder of the Buddha Bar empire? Marrakech has plenty of options for Western food too, if you’ve had your fill of couscous and want something more basic. In a nod to the city’s French influence, many Parisian-style wine bars have popped up around the leafy boulevards of the Ville Nouvelle, including Loft, a stylish, retro space which serves classic bistro fare like steak frites. 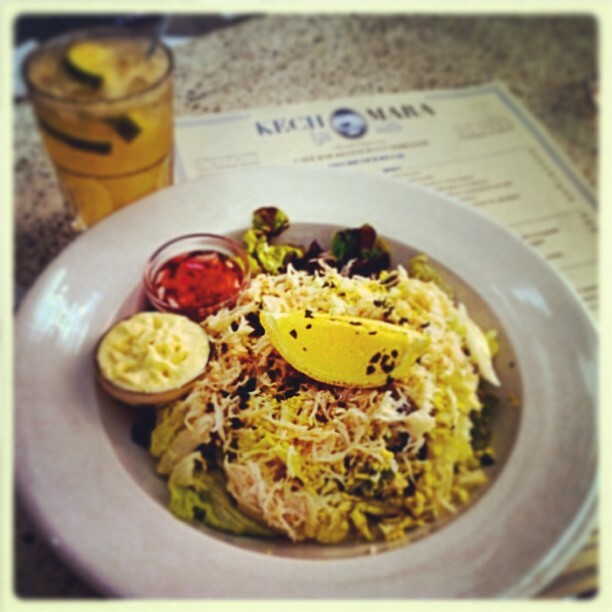 Kechmara is a streamlined, industrial-chic joint known for its rotating art exhibitions and cultural events, as well as its fresh salads and quiches. And carb-craving pasta aficionados can rest assured that their Italian fixes will be sated: Pepe Nero, set unexpectedly in an opulent riad, has an outstanding home-made tagliatelle with chicken and parmesan, courtesy of a Michelin-trained chef; and at the opulent L’Italien, in the swanky new Delano hotel just outside the medina, I tucked into one of the best Italian meals I’ve ever had in my life, centered around a decadent riff on the classic spaghetti carbonara, topped off with a dessert of affogato with vanilla ice cream. Nightlife offerings throughout the sultry Red City are just as diverse as the culinary options, ranging from modern to old-world: the decadent Comptoir Darna and Jad Mahal live up to your most outrageous Arabian Nights fantasies, with extravagant decor and belly dancers galore; Sky Lounge at the Delano is pure Miami chic; Lotus Club has a retro, flapper vibe; and So is the ultimate mega-club, with a more low-key outdoor patio area for when the thumping base gets overbearing. And quirky Djellabar may be a relatively recent arrival on the scene, but its kitschy décor and sound track filled with 80’s pop tracks set to Moroccan instruments make it a favorite for the fun-loving set.